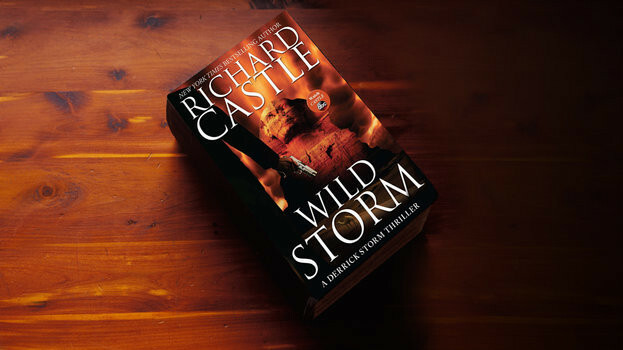 Castle fans are in luck this month with double Derrick Storm action from bestselling author Richard Castle! 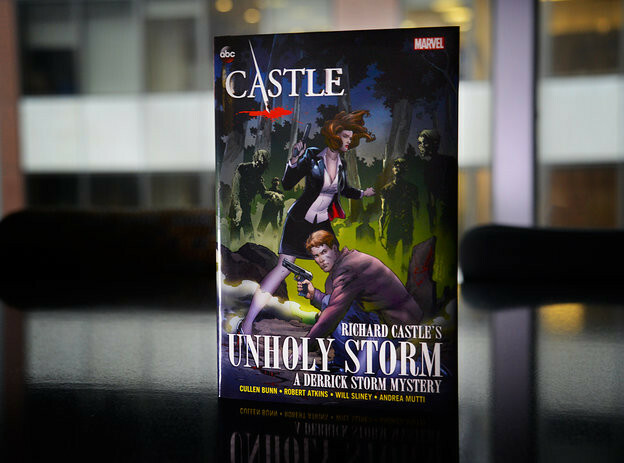 Both a new graphic novel Castle: Unholy Storm and full-length novel Wild Storm will soon be hitting bookshelves across the country on Tuesday, May 13th. Get the scoop on each book and exclusive sneak peeks below! Derrick Storm, the guy the CIA calls on when it wants something investigated domestically, is thirty-three thousand feet in the air, returning from a rock climbing vacation in the Swiss Alps, when the plane spirals into a nose-dive. Storm uses his climbing gear to tether himself to the wing and heroically save the plane and all the people on board. Sadly, Storm is not available to come to the aid of the three other planes that have crashed under similar circumstances, killing everyone on board. Interestingly, many of the victims are powerful people in politics, business and religious groups. The always elusive Jedidiah Jones, leader of the National Clandestine Service that has no name, calls on Storm to investigate. Storm determines that an unknown extremisthas secured enough of the rare earth element promethium to create a laser withthe power to shoot down planes from the ground. The problem swiftly becomes a global one as four more planes crash in the Arabia Desert. Details, intuition and courage lead Storm to Monaco, Panama City and Egypt as he meets beautiful women, rides angry camels and rescues innocent victims in his valiant effort to track down the maniacal mind. Derrick Storm is back and he has a new, deadly case to solve. When the daughters of four high-powered international businessmen are discovered dead in New York, the NYPD scrambles to bring the murderer to justice. But when a fifth girl is found mutilated in a pool of her own blood, her prestigious French family hires Derrick Storm to run his own investigation and find the real killer. Storm has only one lead - a strange symbol drawn in blood. Storm enlists the help of the beautiful and daring Clara Strike, his CIA handler. Together they uncover a deep web of deception under the guise of mysticism and devotion. CASTLE: UNHOLY STORM brings together a star-studded cast of the best creators in the industry, including writer Cullen Bunn (Fearless Defenders, Venom), interior artists Robert Atkins (Amazing Spider-Man) and Will Sliney (Fearless Defenders) along with cover artist Carlo Pagulayan (Iron Man, Hulk).